In 2009, Guinness celebrated its 250th anniversary and honoured their founder with an amazing musical celebration on 26th September at 17:59 in remembrance of that fated day. This year again, inpubs across the country exciting Irish and International artists will be turning up without prior warning to perform to lucky pub goers! Kodaline with many more to follow! There will be five ticketed events and other free events happening across the country – the atmosphere is set to be electric. Guinness aims to showcase and promote the best of Irish talent. On Arthur’s Day 2013 the Guinness Storehouse at St James’s Gate Brewery will be transformed into a cultural hub in order to best show-off Ireland’s greatest talent and creativity in Music, Sports, Food and Art. The aim is to promote Ireland and Arthur’s day well beyond music, and to showcase the excellent variety of talents that Ireland has to offer. The event raises money for charities every year, including the Arthur Guinness fund (see video) which helps social entrepreneurs. It’s simple – get down to your local pub this year and get in on the action. Missed out this year? Contact us now! 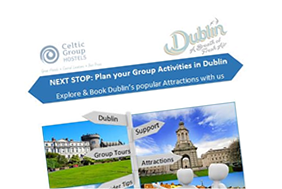 and book your group’s Dublin hostel accommodation and a visit to the Guinness Storehouse for 2014. We look forward to welcoming you to Ireland! Blog post courtesy of our marketing intern Anna.